Simplex helps biopharma companies get drugs to the clinical trial patients who need them. We create focused and customized planning tools designed for the unique complexities of clinical trial supply chains. Built on our proprietary software platform, these tools enable biopharma companies to react and adapt in a dynamic, high stakes, and competitive environment. 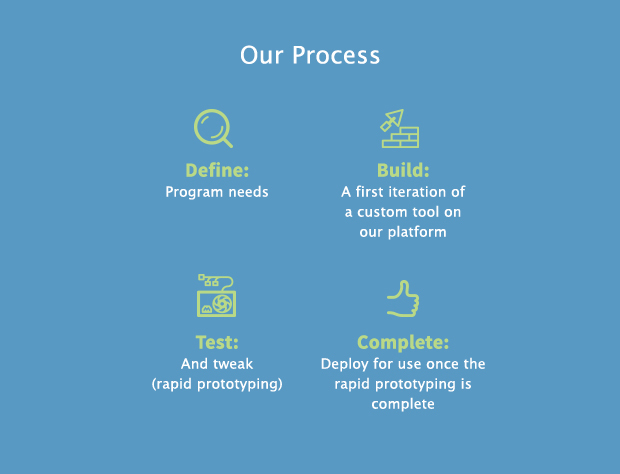 We use a rapid prototyping process to create customized tools that are both powerful and easy to use because they do only what is needed and nothing else. Simplex lets clinical supply management teams focus on analysis and strategy, not software configuration. Simply put, even though you don’t see it in the news, getting the clinical supply chain right is mission critical to drug development. 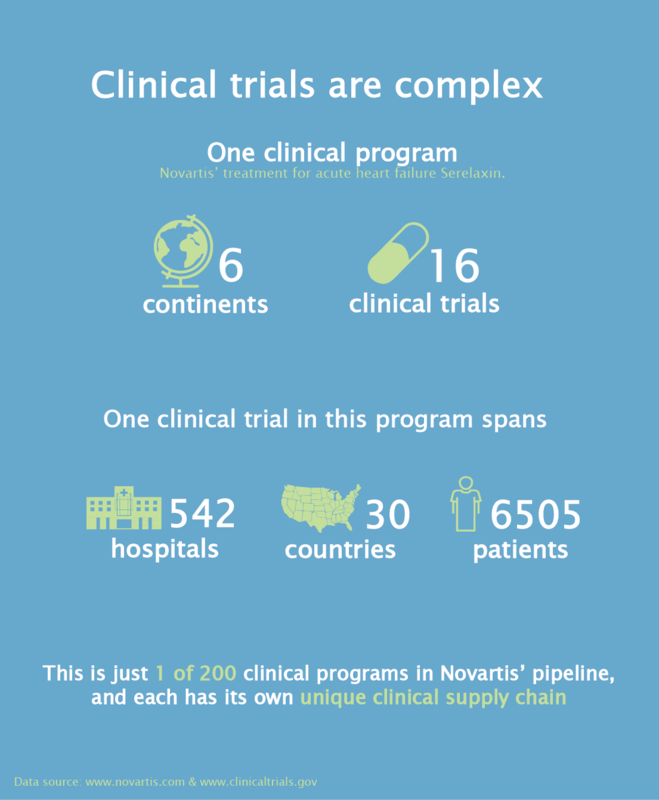 At the same time, clinical development programs and their supply chains can span the globe and be fantastically complex, requiring significant and unique planning capabilities. Drug development is also an expensive and high stakes endeavor. The Tufts Center for the Study of Drug Development recently estimated that all-in it costs an average of $2.6 Billion (yes, Billion) spent over the course of 10+ years to get a new drug to market. At the same time, the top 20 drugs by sales as of 2014 all have annual revenue greater than $4 Billion. Even the 50th drug on the list comes in at $2.2 Billion per year. Put all of this together and what you have is an extremely long and expensive product development cycle with patient welfare and billions of dollars per year in revenue at stake. At the core of this activity is a complex, mission-critical, but mostly unseen supply chain process that requires advanced planning capabilities to work smoothly. But here’s the thing: The tools that are out there now for clinical supply chain planning just aren’t all that good. We hear the same thing over and over again from clinical supply professionals: they need better planning tools than those currently available. Why is that? Anyone who has ever worked at a big company already knows the answer to this question. You need to work with some complex ERP or CRM system that does everything under the sun and then some. But, because the software 'does everything' it is impossible to use. The same in clinical supply chain planning: current tools are designed to meet the needs of all clinical programs, but because of that they really meet the needs of none. In reality, every drug development program is unique and has its own unique supply chain. Planning for that supply chain involves decisions about which variables matter and which don’t. Focusing only on the important variables means finding the best balance between the value and cost of planning. This is the planning sweet spot. Current solutions are often so difficult to use that the vendor needs to offer additional and expensive “consulting” services. We’re talking hundreds of thousands of dollars a year to help customers effectively use a product they already bought. Clinical development programs and their supply chains are extremely diverse, and the “one size fits all” mentality just doesn’t work. 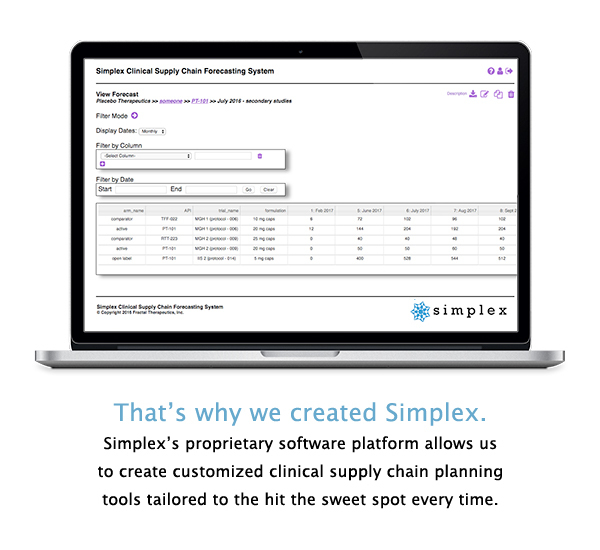 From simple demand forecasting all the way to fully integrated supply chain planning that includes optimized manufacturing/packaging schedules and site logistics, the Simplex platform is designed to meet the unique supply chain planning needs of any clinical development program. At Simplex, we want to give each user the right tool for the planning task at hand, every single time, and to do it quickly. Our solutions are built on our proprietary platform using a rapid prototyping process designed to allow us to quickly define, develop, and deploy clinical supply chain planning tools. We aim to give clinical supply chain managers the features they need, and none of the ones they don’t. And to do it fast. Demand Forecasting Tools: A set of pre-built tools designed to make it easy to forecast end-patient demand in early-stage clinical programs. These flexible and easy to use tools are specifically designed to address the functionality gaps of existing vendor tools and to be our “foot-in-the-door” product. Custom Tools: A service in which we build customized planning tools for valuable late-stage clinical programs (typically Phase II+) which leverage the full power of the Simplex platform to do (for example) manufacturing planning, site logistics planning, optimization, and, Monte Carlo simulation. Developed through our rapid prototyping process aimed at quick design and delivery, these tools are a natural “up-sell” from the demand forecasting tools. Both the pre-built tools and custom tools are developed using our rapid prototyping process. Because they’re hosted on our platform all of the tools will interoperate smoothly, allowing users to apply multiple tools to any planning problems as needed. Supply chain managers get focused and powerful planning tools that they know how to use. Instead of spending months configuring software or endlessly fiddling with spreadsheets, clinical supply teams can focus on high-value activities like strategic planning and scenario analysis. And they definitely won’t need expensive “consulting” support from us just to use our software. Simplex leverages the power of agent-based simulation (ABS), an extremely powerful and flexible modeling paradigm for systems composed of discrete entities. Originally pioneered by biologists and economists, ABS has increasingly been applied to a range of business problems over the last two decades and is a natural fit for supply chain planning. This is why we decided to base Simplex on a proprietary ABS platform fully developed by our team - it's what gives us the flexibility to rapidly develop and deploy customized planning tools. Powerful Engine: A proprietary agent-based simulation platform designed to model real-world systems composed of discrete entities. 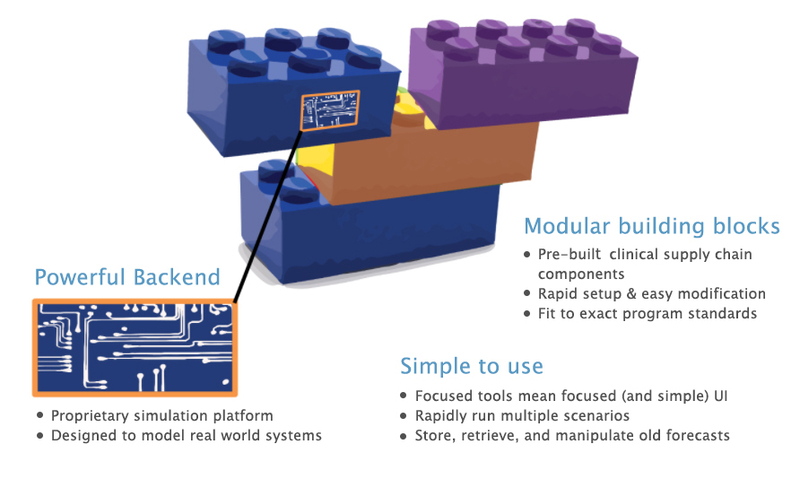 Modular Building Blocks: Pre-built clinical supply chain components enable rapid setup and easy modification of customized tools. Simple to Use: Focused tools mean focused (and simple) UI, making it easy to rapidly run multiple scenarios and store, retrieve, and manipulate old plans. From a simple business idea to a powerful software platform, Simplex has come a long way. Here’s a look at some of the milestones we’ve reached and how we’re continuing to grow. Both of our product tiers are up and running on our software-as-a-service (SaaS) platform, and are being evaluated by three beta customers in the biopharmaceutical space. All of the underlying code is proprietary and under copyright to Simplex. We may also explore the possibility of filing some related patents. These relationships will supply critical market feedback as we continue to validate our product and platform in preparation for our commercial launch. We continue to have a number of in-depth conversations with clinical supply chain groups at bio-pharma companies here in Boston, which have been extremely informative during our product development. Clinical supply chain groups have been very interested in talking with us, suggesting that the idea of focused, customized, and easy-to-use tools resonates with customers in this space. We expect our platform, both the demand forecasting tools and the custom tools tier, to be ready to be ready to sell within the next 30 days. The goal now is to continue building our momentum by increasing brand awareness and expand our B-to-B sales effort and pipeline. Our initial sales efforts will focus on leveraging personal contacts and referrals within the local Cambridge/Boston bio-pharma community, a rich ecosystem of potential sales target comprising everything from early clinical-stage start-ups to global pharmaceutical companies. We’ll later address the wider clinical supply chain audience nationally and globally. Clinical supply chain management comprises a tight-knit target audience, so we expect that our outreach efforts will continue to build brand awareness through word-of-mouth and social proof. We aim to build on this progress by creating a focused publishing campaign consisting of whitepapers and other original content of interest to target clinical supply professionals. We’ll utilize the conference circuit, LinkedIn, SEO optimization, and (possibly) targeted internet advertising to effectively drive awareness. We are poised to begin aggressively selling the base tier of our platform, the demand forecasting tools. This is our moderately priced "foot-in-the-door" product offering and is designed to gain a customer position from which we can upsell more powerful, sophisticated, and higher priced custom planning tools. Our goal is to "productize" the learnings from our custom tools and go from being "just" a forecasting and planning tool to becoming a comprehensive clinical supply chain operations management platform for customers of all sizes. Our vision is to be our customer's central hub for clinical supply chain design, optimization, data integration, and control through the entire clinical lifecycle. Beyond this, we’ve already had informal inquiries from contract manufacturing organizations (CMOs) and clinical research organizations (CROs) about our platform and technology. These are natural potential marketing and sales partnerships for Simplex, and could also potentially lead to an extension of our services to supply chain planning for commercially marketed drugs. Want to learn more and what we have planned for the future? Make sure to request access to the Business Plan tab of the profile to find out how you can get involved! Peter started his professional career as a software developer, writing enterprise Java applications in a startup setting. Since then, he’s held positions at Merck, Vertex Pharmaceuticals, Deloitte CRG, and Takeda Pharmaceuticals. During his time in pharma, Peter developed a deep familiarity with forecasting problems, and his engineering and software background led him to look for more robust solutions to these issues. Prior to founding Simplex, Peter built and ran the Decision Science group at Takeda Pharmaceuticals, which was responsible for providing practical modeling and simulation support for several different business groups at Takeda. One of the group’s projects involved the development of Simplex’s proprietary software platform, which Peter and his co-founders out-licensed from Takeda. Peter has a BS in Applied Physics from Columbia University, an MS in Biomedical Engineering from the University of California, San Diego, and an MBA from Carnegie Mellon. Doug brings a broad, multidisciplinary skillset to bear on the problem of clinical supply software design. During his time at Takeda Pharmaceuticals, Doug ran a number of teams focused on custom mathematical modeling and user interface experiences for various applications. These experiences have ingrained in Doug a passion for finding simple, effective solutions for complex problems. Doug has an undergraduate degree from the University of Washington and did his Ph.D. in Biomedical Engineering at Georgia Tech. Helen is experienced with the specific marketing and strategic needs of early-stage bio-pharma and healthcare startups. She has previously worked as a product manager in Cellaria, an oncology model startup, leading efforts in branding, marketing, and customer outreach. She is passionate about bringing new innovations to market and has a degree in Materials Science Engineering from MIT. Arijit is a drug development scientist and manager. During his time at Takeda Pharmaceuticals, Arijit served as the discovery project leader for many clinical project teams that had molecules undergoing clinical development. This stint taught him the value of looking for robust solutions to recurrent problems in development. After this experience, Arijit built and ran the Modeling and Simulation function at Takeda’s Cambridge MA site. Arijit’s background spans science and engineering, with a Ph.D. in Biochemistry from Dartmouth College, and undergraduate degrees in Biology and Pharmacy from BITS Pilani, India.